When one of Nigeria’s biggest media moguls began collecting contemporary African art three decades ago, he was one of the few Africans in a niche market dominated by western connoisseurs. 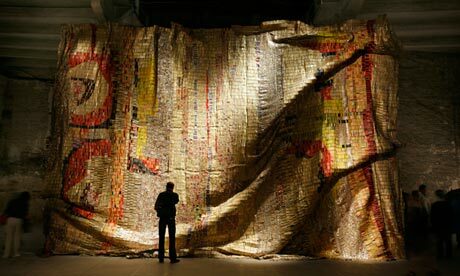 But as African art becomes more sought-after globally, that is rapidly changing. “Some of the things I bought just for aesthetic pleasure years ago are now worth millions,” said the wealthy businessman, who did not want to be named for fear his home could become a target for thieves. “A lot of people on both sides of the pond are waking up to the fact you can make big money in contemporary [African] art,” he added, reclining on a golden sofa in his Lagos home crammed with expensive art from across the globe. As African economies outperform the global average, a collectors’ scene is booming among emerging elites and a growing number of foreign buyers. When Nike Davies-Okundaye began selling adire – a Nigerian traditional textile art she learned from her great-grandmother – in the 1960s, “only expats liked buying, even though our forefathers were already art lovers”, she said on a walk through her gallery, which sprawls over four floors, the largest in west Africa. Nowadays she has a global clientele and, increasingly among locals, young business people wanting to invest their money in safe assets. “Young Nigerians are now driving the art scene – they are becoming the biggest patrons of Nigerian art,” she said. Growing incomes colliding with a rich history of visual arts have seen fine art sales soar in other African countries too, said Davies-Okundaye, who helped establish one of Kenya’s first art galleries in the 1980s. The boom has been most pronounced in Nigeria and South Africa,the continent’s two biggest economies, which between them account for half of Africa’s billionaires. Increasingly, local rather than imported artwork adorns the walls of many glitzy offices and restaurants. “One stockbroker I know recently went and bought so much art he didn’t know where to put it. He actually had to put some of the paintings on the ceilings,” said Arthur Mbanefo, a prominent sponsor, visibly distressed by the collision between art and Nigerians’ flair for exhibitionism. As African nations replicate a trend witnessed by emerging countries, such as Brazil and India, over the past decade, the fever is also sweeping across international galleries and exhibitions. Last year El Anatsui’s New World Map tapestry – made using flattened bottle tops of cheap African liquor – sold for a record-breaking £541,250 at a Bonham’s auction of African art. “Artworks from hitherto unacknowledged regions of the world, not only Africa, are being collected as artworks rather than curios or ethnological objects,” said the Nigeria-based artist, whose colossal outdoor installations draw huge crowds to galleries in Berlin, Paris and New York. Nevertheless he dismissed the “African artist” label. “Art is a universal sensibility,” he said. This year Angola became the first African country to win a prestigious Golden Lion at the Venice Biennale and, in London, the Cameroon-born curator Koyo Kouch plans to show work from the continent at Frieze. This month, London’s Tate Modern opened its first major exhibition of work by African artists Meschac Gaba of Benin and Sudan’s Ibrahim el-Salahi. “Before, there would be moments of huge interest and then another 10 years would pass before we saw anything,” said Kerry Green, head of Tate’s African art acquisitions committee, which was set up last year. “Acquiring African collections before was very much ad hoc,” added Green, whose team visited Nigeria for its first annual trip, and plans to visit South Africa and Cameroon next year. Some worry that huge sums of money flooding in to the region could distort attempts to police a fledgling art market. “We have had people return objects they buy from the roadside which turned out to be heritage art stolen from this very museum,” said a worker at the national museum in Lagos.